Opening with half a minute of black-screen silence, at first glance Buried could be mistaken for self-indulgent filmmaking. As if someone saw the “buried alive” scene from Kill Bill, Vol. 2 and simply wondered what it would be like to extend that to an entire film. Somehow the result, despite its limited range, proves one of the most compelling – if not actually enjoyable – experiences of the year. Paul Conroy [Ryan Reynolds] is an American truck driver working in Iraq. 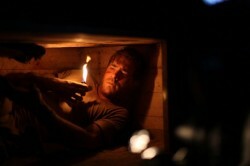 After an attack on his convoy, he awakes to find himself trapped in a wooden coffin buried underground. His only tools to find rescue are a lighter, a torch and mobile phone, with limited signal and battery life. As the sole actor on screen, the entire film rides on Reynolds’ performance and it is mesmerising. The viewer feels every emotion as his predicament elicits fear, frustration, anger and despair. The bold decision to keep the entire film restricted to this single box, rather than using flashbacks or cutting to those with whom Conroy communicates, creates a visceral atmosphere that is certainly not suitable for those with claustrophobia. Yet, incredibly, Cortés never loses his audience’s interest through monotony Clever camera placement and shifting angles create variety, along with altered lighting from the static torch, flickering lighter or soft glow of the phone screen. The supporting characters are merely disembodied voices, but provide an opportunity for Reynolds to engage with others. The viewer swiftly fills in these characters and they seem as real as many characters one might normally expect to occupy the screen. 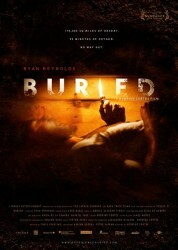 From the opening shot it is clear that Buried is something very different, focusing on atmosphere and mood rather than plot or gore for its twisted suspense. For an hour and a half the viewer feels trapped inside the box with Conroy and while that may not be pleasant, it certainly leaves a lasting impression.